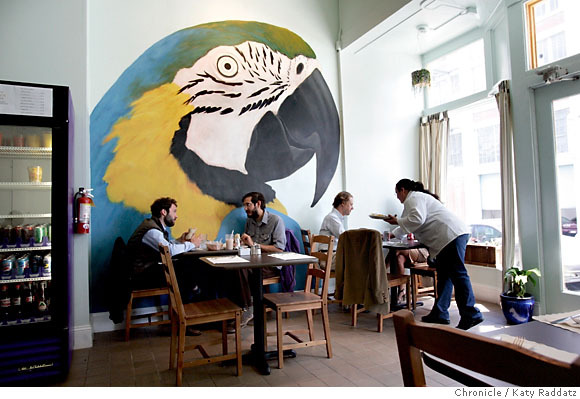 "Diego" giant blue and gold Macaw parrot, painted by Lynne Rutter for the New Spot, San Francisco. 10 x 13' acrylic on canvas. 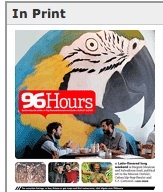 While visiting the Urban Farmer this afternoon, I noticed a giant parrot on the cover of the 96 Hours weekend insert of the San Francisco Chronicle. A nice review of the New Spot, for whom I painted this mural, is featured, along with some other good pictures.